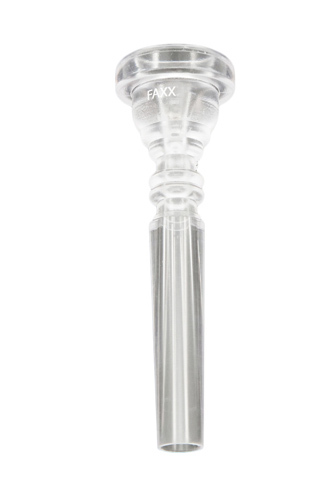 The Faxx range of clear Trumpet mouthpieces offer an excellent value alternative to the standard nickel silver Trumpet mouthpieces that commonly come with an instrument. These clear plastic mouthpieces have the advantage of not requiring an extensive warm up, making them more comfortable in any temperature. They are also helpful if you have a nickel intolerance or find the nickel silver mouthpieces tough on your lips. Available in 3C, 5C and 7C. The 7C has the narrowest cup diameter making it more suitable for new beginners. The 5C and 3C have wider rim diameters (respectively) and would be more suited to the advancing player who can fill the diameter more easily and will benefit from a broader, richer tone.